1. Have you ever tried to learn (or re-learn) a foreign language as an adult? Which one? What worked for you? no, I learned foreign languages (french and spanish) in school..I have tried learning some sign language as an adult. I use it the most because I use it with my work. 2. Do you donate blood? Do you know your blood type? I do not donate blood, I believe I am A positive, but I am not sure why I know that. Maybe it isn't. 4. Do you use certain text or ring tones for specific people? Who gets their own? Or do you just use the default on your phone? I use certain text tones for the people that message me a lot. My husband has a very distinct one so I know to check it right away. I use a default ringtone for everyone. 5. When did you get your first digital camera? Do you still shoot on actual film, or all digital now? It was probably shortly after my son was born...he is 20. I had film before that of course, but we are completely digital now. 6. What do you think someone else would say the most daring thing you’ve done is? I am not very daring. I will do things others will not though, so I just do not consider anything I do daring. I have no idea what others think of me. 7. Do you talk with your hands? Yes! 9. What kind of milk did you drink, growing up? And now? I do not like milk, so none. I use it in cereal though. 10. How do you keep track of all your passwords? Do you make your passwords super complicated and change them often, or use the same ones over and over? I have a few different ones I use and variations of the same ones. I write them down. 11. Are you a note taker? Oh goodness yes, it helps me learn and remember to write things down. 13. Do you have a “power” song? Not really, that is probably a good idea to have one though. 14. Do you have an eclectic mug collection, or is your stuff all matchy matchy? eclectic, I have several teacher mugs from students over the years. I also have matching ones that go with my dishes. I never use them though. 15. Do you have a junk drawer in your house/garage/at work/wherever? Several and a junk room. I worked over the summer trying to clean that stuff up. 17. Have you ever woken up and felt guilty from a dream you had, or, mad at someone else for something they did in the dream? no, but I did have a dream once that my son died and I woke up very upset and crying. 18. How old were you when you took your first commercial flight? To where did you fly? I have never flown anywhere. We drive when we go on vacation. 19. Are you good at keeping track of your things – or do you easily misplace them? Do you ever leave anything behind when you travel? I am good at keeping track of my things, but if anyone moves anything, I am lost. I rarely leave things behind, I used to do that as a kid though. I would leave things at my Granda's house. 20. Is there any place you go where time seems to stand still? What is it about that place that makes it that way? Maybe the lake or ocean. I can get lost listening to the water because it is so relaxing. hi Lori, enjoyed your answers today I love sitting by the ocean! I enjoyed your answers, Lori! 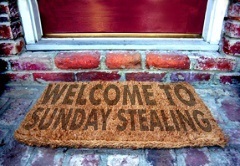 Thanks for going by my Sunday Stealing! Wishing you a good week ahead, my friend! We have way too many junk drawers. One of these days . . . I love your Fall signature tag!! So cute!!! Happy Columbus Day Lori. Loved your answers to Sunday Stealing. One day I'm going to do that meme. :) Have a day of blessings my friend.